VIDEO: Airborne Fest, Brit Style! Peeling:This simple but highly effective technique is mainly used to move to the flank; elements or individuals are in line facing the enemy threat and will ‘peel out’ to either the left or right. This is a good technique for moving along a linear feature, such as a road or ditch, while producing maximum suppressive fire. It is better to ‘peel’ than to simply get up and go. The reason I say that peeling is mainly used to move to the flank is because for moving forwards towards the enemy or moving backwards away from the enemy generally the most appropriate method is to use simple fire and movement, otherwise known as bounding over-watch. It is up to you to take your team/formation and work through ‘actions on’ utilizing these methods to suit your particular formation/ team/ environment/ situation. Peeling can also be used as a method of moving to the rear (i.e. if the unit was contacted from the front while in a file formation), but in that case because the team will be in line (single file or file) the firepower generated to the front is limited. However, it’s very useful if for example there are enemy on both sides of the road/trail; the technique can be used from the file with individuals peeling from one end of the formation, down the center (‘down the tunnel’), to the other end, thus moving the formation out along the linear feature while generating maximum suppressive fire towards the enemy on both sides: this is known as a ‘center peel’. With the peel, when the formation needs to move right, individuals or elements will move from the left side, behind the formation, and peel back in on the right. The opposite for moving left. As each individual passes the next man, who will be providing suppressive fire, he shouts something along the lines of “Move!” or “Last man!” or kicks his foot etc., in order to ensure that the next man knows to move. The technique is a flow of constant fire and movement. It can also be used, for example, as a way of moving to a flank out of an area of open ground to cover, when contacted by an enemy to the front. Don’t confuse the use of techniques such as this with excessive expenditure of ammunition, which you may have seen on ‘youtube’ or similar. Peeling does not require massive firepower. The idea is to return fire to suppress the enemy to cover movement. You could do this with bolt action rifles if you had to, so long as you made your shots count. The basic principle is the same. With the center peel method all the patrol members step to the left or right accordingly to create a file, or tunnel formation. This will only allow the front two riflemen to engage but it is useful for withdrawing along linear features or where fire is coming in from the front but also to the front and flanks on both sides. The front people will return fire and then in sequence they will turn and run through the center of the tunnel, peeling back in at the other end. This allows the next front people to fire and the process will continue with the tunnel turning itself inside out all the way back to a suitable rally point. It is effectively a peeling technique with two lines. The fire and movement method would be for the front team to return fire, with the two rearmost riflemen of that front team stepping out to the sides to allow them to fire: effectively ‘getting on line’. These two pairs would fight back utilizing fire and movement. The rear team would take up security positions and then begin to move back, utilizing bounding over-watch, to secure a rally point. This video below contains a practical demonstration of some of these techniques, if you move to the second half past the vehicle drills you will see fire and movement and towards the end there is a peeling drill. In this case, it is in response to a “Contact Right” after the team ‘gets on line’ to face the threat to the right and then peel back to the vehicles. There is no center peel in this video. In the video below, Navy SEALs demonstrate a center peel, with massive expenditure of ammunition Clearly they will need a fast resupply in order to continue. For a prepper or Resistance fighter, this sort of ammunition expenditure is prohibitive and also arguably gratuitous and lacking utility. What the SEALs are doing is trying to generate massive suppressive weight of fire in order to overwhelm the enemy and let their smaller team escape (break contact). That is all well and good, so long as the fire is accurate enough to actually suppress the enemy. There is a balance between weight of fire and accuracy. Draw your own conclusions! This information is extracted in part from my manual ‘Contact! 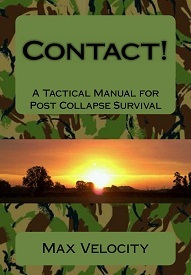 A Tactical manual for Post Collapse Survival’ and is also incorporated into the novel ‘Patriot Dawn: The Resistance Rises’. Required reading for the difficult times we are facing! hey max, just read both this week. contact! was a tad heavy on the full-on combat for me but i got a lot out of it, especially the driving sections. i’m amazed at how fast skills/knowledge fade once out of the game, and contact! was a good refresher. 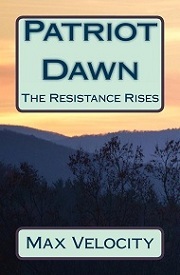 patriot dawn was a good read. i thought a touch overeaching on stuff like how they gathered heavy weapons but hey, its fiction, and as such i enjoyed it immensely.i will be testing out the thermal blanket tip. both were well worth the money, which i don’t say often when it comes to books. sequel in the works? Thanks for the feedback. True, you may not have the heavy weapons – or maybe you will acquire them at some point – but the idea of those specific parts was to show what can be done. Work with what you have, or can get hold of. Insurgents in Iraq, Afghanistan, Libya, Syria etc. have heavy weapons, they just don’t often use them very well. Sequel: its planned, but not written yet! i’m relying on thermite to hold me over until i can “aquire” heavy weps. frankenstien hit my heaviest wep on the last line of her hit list:)well almost the heaviest. she missed the dotfivezero apit. i’ll be watching for that sequel, if i live long enough. si vi pacem, para bellum. ambushing a Jap column “w/in 30 seconds they’d hit us with an accurate knee-mortar barrage, and in less than a minute feeling around for our flanks…”. If there are any videos you can post illustrating more “offensive” contact tactics, I’d like to see them. A good visual of this is in the movie Tears of the Sun, they show how to peal, but not where to go. Then where to go is based on what you are facing.